Love tacos, but watching carbs? 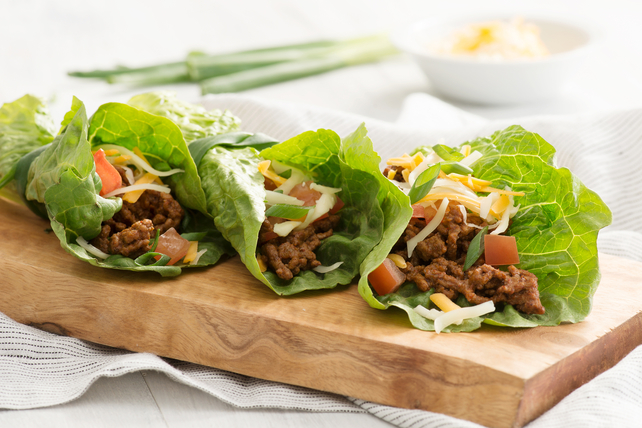 Try our quick Taco Lettuce Wraps recipe. It’s sure to become your new go-to favourite! Spoon onto lettuce leaves; top with remaining ingredients. Roll up. Prepare using lean ground chicken or turkey. Add one or more of your favourite taco toppings, such as chopped avocados, salsa, sour cream and/or chopped fresh cilantro, before rolling lettuce leaves up. Prepare using your favourite Kraft Shredded Cheese, such as Tex Mex, Mozza-Cheddar or Old Cheddar.